Background Rheumatoid arthritis is characterised by antibodies to citrullinated proteins (ACPA) and rheumatoid factor (RF) in the preclinical phase. Objective To determine whether an intervention aimed at decreasing autoantibody levels in people at risk may be effective in preventing progression to arthritis. Methods 83 patients with arthralgia positive for ACPA or IgM-RF were randomly allocated to intramuscular injections of 100 mg dexamethasone or placebo at baseline and 6 weeks. The primary end point was a 50% antibody reduction or normalisation at 6 months. Results The primary end point was reached in one patient in each group. Patients treated with dexamethasone had reductions of antibody levels after 1 month (ACPA 222% and IgM-RF 214%), which persisted at 6 months for ACPA. During a median follow-up of 26 months, arthritis development in both groups was similar (20% vs 21%). Conclusion In autoantibody-positive patients with arthralgia, dexamethasone treatment decreases ACPA and IgM-RF levels, but does not prevent arthritis development. Rheumatoid arthritis (RA) is characterised by autoantibodies in the preclinical phase.1 2 We have reported the presence of antibodies to citrullinated proteins (ACPA) and/or IgM rheumatoid factor (IgM-RF) in 49% of blood donors who later developed RA; seroconversion occurred at a median of 5 years before the onset of symptoms.2 The risk of the development of RA within 5 years in the presence of one or both of these antibodies was estimated at 2% in the general population, increasing to 44% in people having multiple family members with RA.2 An intervention designed to prevent or delay the onset of arthritis in people with such autoantibodies would need an estimated time frame of 5 years, the average period of preclinical seropositivity. However, the effect of an intervention in reducing levels of autoantibodies can be measured much sooner, which makes the reduction of autoantibody levels an attractive intermediate end point. Since ACPA are thought to have pathophysiological properties,3 a major reduction of levels may help to diminish the propensity to develop arthritis. Treatment of RA has proved to be more effective in the early phase of RA than in the late phase, leading to the concept of a “window of opportunity” for the treatment of early RA.4 Similarly, it may even be possible to suppress the disease in the preclinical phase, preferably with a short and relatively non-toxic intervention. Several drugs can reduce autoantibody levels in patients with RA, although the extent of these effects varies considerably between drugs and between studies.5,–,8 High-dose glucocorticoid treatment is relatively safe and reduces IgM-RF levels in patients with RA by more than 50%.5,–,7 We have made similar unpublished observations regarding ACPA reduction. In this study we report the results of a randomised double-blind, placebo-controlled trial of dexamethasone in ACPA- and/or IgM-RF-positive patients with arthralgia aimed at the reduction of autoantibody levels in the short term with the ultimate goal of preventing arthritis development in the long term. Between June 2004 and 2007, 227 ACPA- and/or IgM-RF-positive patients with arthralgia were recruited at rheumatology clinics in the Amsterdam area of the Netherlands. Presence of the shared epitope (SE) was required as this was expected to be an additional risk factor for arthritis development. Eighty-three antibody (ACPA and/or IgM-RF)-positive patients with arthralgia were eligible for randomisation. Main exclusion criteria were absence of the SE (n=90), presence of arthritis at baseline (n=31) and refusal of dexamethasone (n=16). The intervention comprised two intramuscular injections at baseline (t=0) and 6 weeks of either 100 mg of dexamethasone or placebo. Safety was assessed with adverse event reports recorded 6 weeks after each injection. The study was approved by the local ethics committee and all patients gave written informed consent. ACPA, IgM-RF, total IgM and IgG and C-reactive protein levels were determined batchwise at the end of the study using serum samples that were obtained at inclusion and 1, 3 and 6 months after the first injection. SE status was determined as described in the online only supplementary data. The primary outcome measure was arbitrarily defined as a 50% reduction of one or both autoantibody levels at 6 months (analysed using Fisher's exact test). Between-group comparisons of antibody levels at 1, 3 and 6 months were assessed using Mann–Whitney U test. Analysis was done with antibodypositive patients only and for both antibodies separately. Cox regression hazard analysis assessed the relative risk for arthritis development in the placebo group compared with the dexamethasone group. Detailed information on the inclusion and exclusion criteria, randomisation procedure, power calculation and laboratory assays is available in the online supplementary data. Table 1 gives details of the baseline characteristics. Two patients in each group were lost to follow-up after the first injection; their baseline values were carried forward. The primary end point of ≥50% reduction in levels of one or both antibodies was reached in one patient in each group. Nevertheless, the dexamethasone group, but not the placebo group, showed significant and substantial reductions of the levels of both antibodies, with a nadir after 1 month (fig 1). Reductions persisted up to month 6 for ACPA (fig 1). The individual percentages of pretreatment values attained, plotted as cumulative probability plots are shown in fig 2 of the online supplementary data. Median ACPA and IgM-RF levels decreased significantly in time in the dexamethasone group (p,0.001 and p=0.01, respectively), but not in the placebo group (p=0.52 and p=0.56, respectively). The effect of dexamethasone on autoantibodies is not a reflection of the decrease in total immunoglobulin levels (see online only supplementary material). Qualitative changes were not seen: none of the patients positive at baseline became negative during follow-up and patients negative for one autoantibody remained negative. Change (percentage of baseline) in antibodies to citrullinated protein (ACPA) and IgM-rheumatoid factor (IgM-RF) levels after dexamethasone or placebo. 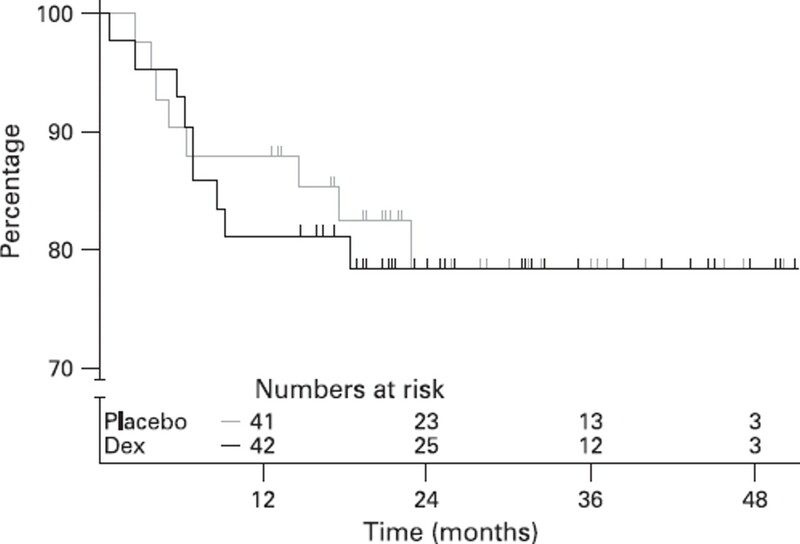 Median change (percentage of baseline) in antibody levels with interquartile range (boxes) and 5–95% centiles (whiskers) for the dexamethasone (grey bars) and placebo (open bars) groups at 1, 3 and 6 months, respectively. * p<0.05, ** p<0.01 when compared with the placebo group. At 1 month, median (IQR) change in ACPA levels was −22% (IQR −29% to −14%) in the dexamethasone group versus +3% (IQR −6% to +13%) in the placebo group (p<0.001). For IgM-RF, corresponding results were −14% (IQR −28% to −1%) versus +1% (IQR −9% to +17%; p=0.003). At 3 months, median (IQR) change in ACPA levels was −13% (IQR −27% to 0%) in the dexamethasone group versus +12% (IQR −8% to +24%) in the placebo group (p=0.001). For IgM-RF, corresponding results were −6% (IQR −26% to +15%) vs +6% (IQR −7% to +29%; p=0.02). At 6 months, median (IQR) change in ACPA levels was −8% (IQR −24 to +2%) in the dexamethasone group versus +2% (IQR −9% to +12%) in the placebo group (p=0.01). For IgM-RF, corresponding results were −2% (IQR −16% to +37%) versus +3% (IQR −9% to +23%; p=0.67). Arthritis free survival is similar in both treatment groups. Kaplan–Meier survival curve of dexamethasone (black line) versus placebo (grey line) comparing arthritis-free survival (y axis). After a median follow up of 26 (IQR 21–37) months in both groups, 9/42 patients in the intervention group and 8/41 patients in the placebo group had developed arthritis in a median of 4 (IQR 3–7) joints; 6/17 fulfilled the ACR criteria for RA (three in each treatment group).11 Median DAS28 score was 2.9 (IQR 2.4–4.2) in the dexamethasone group and 3.7 (3.2–4.1) in the placebo group. The between-group hazard ratio for arthritis development was 1.1 (95% CI 0.4–2.8; p=0.9; fig 2). Arthralgia duration before inclusion was not associated with arthritis development, nor did it influence the results of the analysis. In this first pilot trial of primary prevention in people at risk of developing RA, intramuscular dexamethasone induced substantial, specific and sustained decreases in ACPA and IgM-RF levels. This result was not paralleled by a delay or decrease in the development of arthritis after 26 months. Previous preventive efforts in autoimmune diseases have concentrated on type I diabetes. Trials of enteral or parenteral insulin in relatives of patients with diabetes were not successful in delaying or preventing diabetes.12 13 In contrast to these studies, we applied direct immune suppression in the preclinical phase of RA. We hypothesised that immune suppression as evidenced by a major reduction of autoantibody levels in this very early phase of the disease would alter the propensity to develop arthritis. Now that we know that the observed reduction of ACPA of 22% and of IgM-RF by 14% was not accompanied by less arthritis development, it remains an open question whether a much larger reduction in levels would have achieved this goal. The figure of 20% arthritis development within 2.5 years shows that the risk of arthritis development in autoantibodypositive patients with arthralgia is considerable and occurs earlier than was found before in autoantibody-positive blood donors without joint complaints.2 In the latter, the risk for arthritis development was estimated at 2–44% within 5 years. It is therefore likely that the arthralgia of autoantibody-positive people is often caused by the increasing rheumatoid inflammatory process that has not yet reached sufficient intensity to be detectable clinically. The number of new cases with arthritis in our cohort will most probably increase with prolonged follow-up; however, a doubling of arthritis cases in the placebo group without new cases in the dexamethasone group would be needed to reach a statistically significant difference between both treatment arms. Although dexamethasone does not seem to have an effect on arthritis development, it may still lead to a milder arthritis course. This effect is suggested by the lower DAS at arthritis onset in the dexamethasone group in comparison with the placebo group, although this study was not designed to detect such differences. In conclusion, two intramuscular dexamethasone injections in autoantibody-positive patients with arthralgia substantially decrease ACPA and to a lesser extent IgM-RF levels, but do not delay or prevent arthritis development. Ongoing long-term follow-up will further clarify the effects of this very early intervention strategy. We thank Margret de Koning and Roel Heijmans for their technical assistance, Pierre Bet for the preparation of the study drug and the randomisation procedure and Yvo Smulders for critically reading the manuscript.
. Antibodies against cyclic citrullinated peptide and IgA rheumatoid factor predict the development of rheumatoid arthritis. Arthritis Rheum 2003;48:2741–9.
. Specific autoantibodies precede the symptoms of rheumatoid arthritis: a study of serial measurements in blood donors. Arthritis Rheum 2004;50:380–6.
. Immunity to citrullinated proteins in rheumatoid arthritis. Annu Rev Immunol 2008;26:651–75.
. Treating rheumatoid arthritis early: a window of opportunity? Arthritis Rheum 2002;46:283–5.
. A double-blind placebo-controlled trial of methylprednisolone pulse therapy in active rheumatoid disease. Lancet 1982;2:237–40.
. The clinical and immunological effects of pulse methylprednisolone therapy in rheumatoid arthritis. II. Effects on immune and inflammatory indices in peripheral blood. J Rheumatol 1988;15:233–7.
. Rheumatoid factor measured by fluoroimmunoassay: a responsive measure of rheumatoid arthritis disease activity that is associated with joint damage. Ann Rheum Dis 2002;61:603–7.
. Predictive value of antibodies to citrullinated peptides and rheumatoid factors in anti-TNF-alpha treated patients. Ann N Y Acad Sci 2007;1109:287–95. Diabetes Prevention Trial—Type 1 Diabetes Study Group. Effects of insulin in relatives of patients with type 1 diabetes mellitus. N Engl J Med 2002;346:1685–91.
. European Nicotinamide Diabetes Intervention Trial (ENDIT): a randomised controlled trial of intervention before the onset of type 1 diabetes. Lancet 2004;363:925–31.
. Antibodies against citrullinated proteins enhance tissue injury in experimental autoimmune arthritis. J Clin Invest 2006;116:961–73. Funding This study is financially supported by the Netherlands Organisation for Health Research and Development (ZonMw), grant number 6100.0010. The funding source did not have any involvement in the study design; in the collection, analysis and interpretation of data; in the writing of the report; and in the decision to submit the paper for publication. Ethics approval Approval from the ethical committee, Jan van Breemen Instituut/Slotervaart Hospital, Amsterdam, The Netherlands.